Even James Bond creators would not dream this up. A secret Soviet space station taken out of Russia under cover of night and transported to a Royal Air Force hangar on a remote British island. Yet, that's exactly what happened a few months ago. Never mind that the Cold War had been over for two decades and the transfer took place under a commercial agreement between the two sides, not in a daring commandos raid. Still, the idea behind the move is quite staggering. To be fair it should be said that after the end of the Cold War, a few eccentrics did buy disused missile silos and converted them into funky residencies. However these extreme makeover projects pale in comparison with the turning of a once-secret Soviet space station into an orbiting hotel for western millionaires and opening a tourist line to the Earth's orbit. This is what the company called Excalibur-Almaz promises to do with the hardware leftover from the Almaz project. First conceived in the mid-1960s, the USSR's Almaz was shut down in mid-stream, after orbiting the world's first manned space station dedicated primarily to military activities. 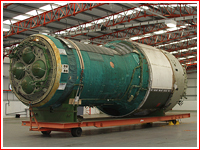 Several largely assembled space laboratories and transport ships to deliver their crews had been gathering dust in the suburbs of Moscow until the collapse of USSR sent the Almaz developer - NPO Mashinostroenia - in search of new commercial customers abroad. 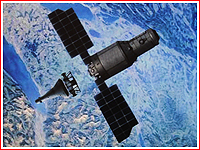 Initial hopes to commercialize the Almaz space station during the 1990s relied on its capabilities to take photographic and radar imagery of the Earth surface. A US-based marketing office, which would offer on-demand imagery to commercial clients, was set up, however the project never took off. Instead, the US entrepreneur Art Dula proposed to use the station as a tourist destination and a commercial research outpost in the Earth's orbit. In 2005, the company called Excalibur-Almaz said it owned eight reusable descent modules of the TKS spacecraft and one space station. The project got little publicity until this year, when one partially assembled Almaz space station (Almaz-205) along with a hull of another vehicle (Almaz-206) suddenly "landed" on the the Isle of Man, UK, of all places. At the beginning of January, the local press ran photos of heavy trucks with carefully draped oversize cylinders navigating the island's awfully steep and angled roads famous for extreme motorcycle races. Both vehicles were stationed in a former Air Force hangar in the town of Jurby on the northern tip of the island, waiting for refurbishment. Considerable work has to be done before any of these vehicles could fly into space. 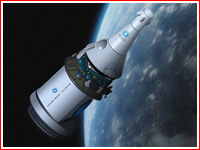 In April 2011, Excalibur-Almaz released new drawings of the Almaz space station integrated with a modified VA crew capsule, which was designed to carry station's passengers to the Earth orbit and back. Although the capsule itself remained largely unchanged it was equipped with a compact propulsion module and a lattice structure attaching it to the tail end of the station. 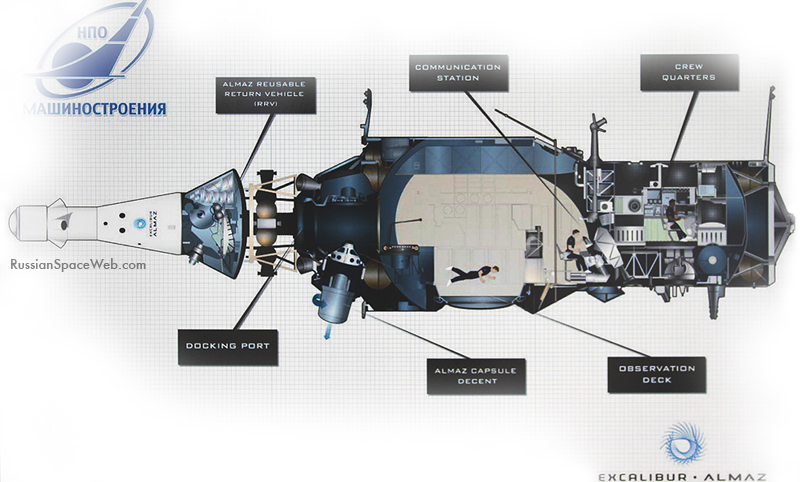 In the original Soviet designs, the VA capsule was connected to the massive FGB propulsion and storage module. Together VA and FGB would form the TKS transport ship. Unlike TKS, the design proposed by Excalibur Almaz featured no visible rendezvous antennas or docking hardware, suggesting that the VA passenger capsule could be launched along with the station. Ironically, this would require to launch the station in the "upside down" position comparing to the original liftoff arrangement of the Soviet Almaz. 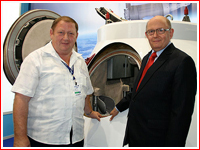 The development of the new propulsion module for the VA capsule was reportedly delegated to an unnamed European organization as early as 2009. At the time, a company's press-release said that initially all flights would be limited to the orbiting of the VA crew capsule. In order to justify the launch of the refurbished Almaz space station, the company would need a backlog of six missions a year. In the interim, Excalibur-Almaz hoped to upgrade the VA capsule with a two-ton service module to provide additional habitable space during tourist missions lasting up to five days. The same vehicle could also be adapted for cargo missions, which could deliver three-four tons of cargo to the orbiting space station. Such a vehicle could also fly five-day autonomous missions or stay docked to a station for up to a month. As of April 2011, the company did not release any official information on what launch vehicles would be used to carry the spacecraft into space. Original TKS spacecraft, Almaz stations and pairs of VA capsules were all launched by Proton rockets. However, according to some reports, Excalibur-Almaz was seeking deals with the Sea Launch venture providing commercial launches onboard the Zenit rocket. Following its bankruptcy and the flight of its traditional commercial customers within the satellite communications industry, Sea Launch could be available to exotic clients like Excalibur-Almaz. However, the financial feasibility of both ventures was yet to be seen. In April 2011, Exaclibur officials denied that any agreement with Sea Launch had been in works.